Save 100% when you buy ONE (1) 1lb. 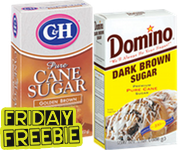 box of Domino® or C&H® Brown Sugar. Check back every Friday for a new Freebie! This entry was posted in Uncategorized and tagged 100% off sugar by commonkindness. Bookmark the permalink.